My contribution to a friend’s Bastille Day party (we celebrated late). Everyone brought some type of French dish – we had mussels Provencal, coq au vin, gratin of potatoes, the panade, and for dessert, chocolate mousse and a rustic peach tart. You can make the panade a day ahead and refrigerate, then pull out of the fridge an hour before baking to take the chill off… or you can bake it the same day you make it. 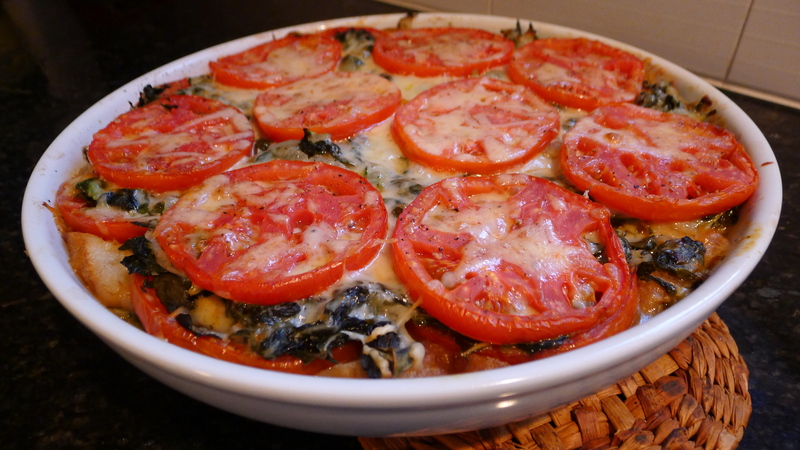 This dish has great layers of flavors, and to me reflects not only southern French cooking but also the delicious bounty of summertime! I wish I could say all the veggies that went into the panade came from my garden, but I can say that some of the chard did as well as all of the basil and thyme, and that’s better than nothing!! 1) In a large pot of boiling water, cook chard for 2 minutes then drain. When cool enough to handle, squeeze out the excess water. 2) In the same pot, heat the olive oil. Add the onions and thyme and cook over moderately low heat until softened (about 12 minutes). Add the garlic, chard and white wine and simmer over moderately high heat until the wine is reduced to 1/4 cup (about 5 minutes). Season w/ salt and pepper. 3) Butter a 14 inch diameter x 3 inch deep baking dish. 4) Line the bottom of the dish w/ some bread slices, top w/ some of the slices of tomato and basil leaves then season w/ salt and pepper. 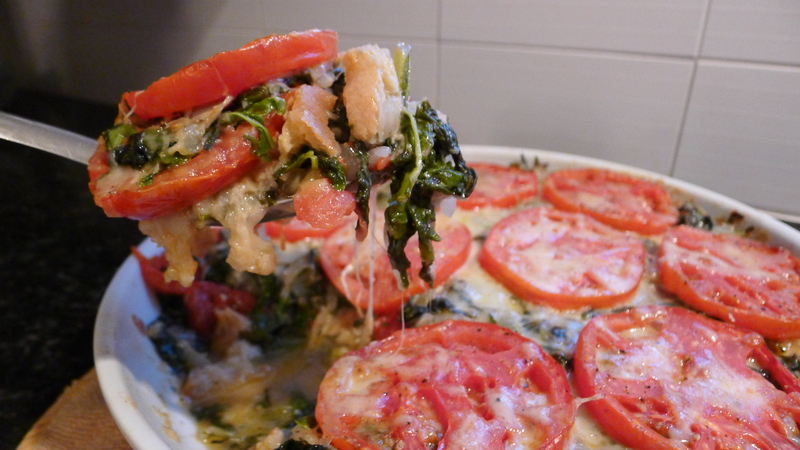 Spread half of the chard/onion mixture on top and sprinkle w/ 1/3 of the cheese. Repeat the layering once again. 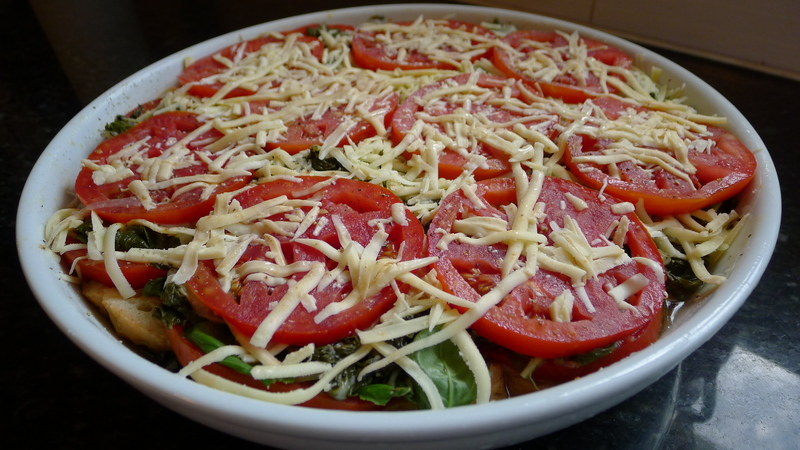 Finish w/ a layer of the tomatoes and sprinkle w/ remaining cheese. 5) Carefully pour the vegetable broth into the casserole and press w/ a large spatula. 6) Cover the dish w/ foil and place in the refrigerator overnight. 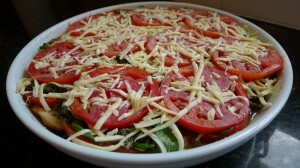 7) One hour before baking, remove the casserole from the refrigerator. 8) Preheat oven to 400 degrees F.
9) Loosen the foil on the casserole and bake in the upper third of the oven for 45-50 minutes, then remove foil and bake for another 10 minutes until the cheese is slightly browned. Remove the casserole from the oven and let rest for 10 minutes before serving. I think Julia Child would have enjoyed this French dish to celebrate her 100th birthday. I hope her and my mom cook this together in heaven someday. I think they would have enjoyed each other’s company and love of French cooking. P.S. – With this newer version of WordPress you can once again click on the photos to enlarge the image. You are currently browsing the brunosdream weblog archives for the month August, 2012.